SIX Network have announced that they are launching the ‘SIX Blockchain startup fund’. The fund will use $15 million to nurture a digital ecosystem in the creative industry. SIX network uses blockchain technology and smart contracts to reinvent the digital economy by building a better infrastructure. Core features within the SIX network include the SIX Digital Asset Wallet, Decentralized Financial Services, and Wallet-to-Wallet (W2W) Decentralized Commerce. With this economic infrastructure, SIX aims to create an ecosystem that is transparent, fair, secured, and efficient for all stakeholders in the digital and creative economy. The company is looking for startups that have built a prototype and established a strong product-market fit. SIX will provide capital, industry connections, and consultants who will help push the startups’ products to market as quickly as possible. The Seed track is for early-stage startups that have already developed a working product but still need to build a larger customer base with the help of the SIX-network infrastructure. The Growth Track is the next stage where a startup moves to when they need more funding to scale their operations. Startups on the Growth track must have already passed the seed stage and entered the market with a business model that is generating profits. These startups will work with SIX to improve the implantation of their business model and strategic operation of their token incentive schemes. Startups can make use of SIX’s blockchain technology to increase the value proposition offered to customers. Six’s network enables startups to connect with customers within the ecosystem while creating a better solution. SIX provides a transparent and decentralized platform that empowers the individual and organization layers of society through technology. Users get unrestricted access to their data and have the ability to address any issues that could have a negative impact on the ecosystem. A hands-on and experienced startup investment team will manage the SIX Blockchain Startup Fund. Moo Natavudh, who is a Venture Partner at 500 Startups and Co-CEO of SIX Network, will lead the team. Natavudh has experience funding over 50 startup companies in Thailand and SEA including Omise, Stock Radars, Finnomena, Chomchob, Fastwork, Pomelo, Hubba, Flow Account, and Skilllane. 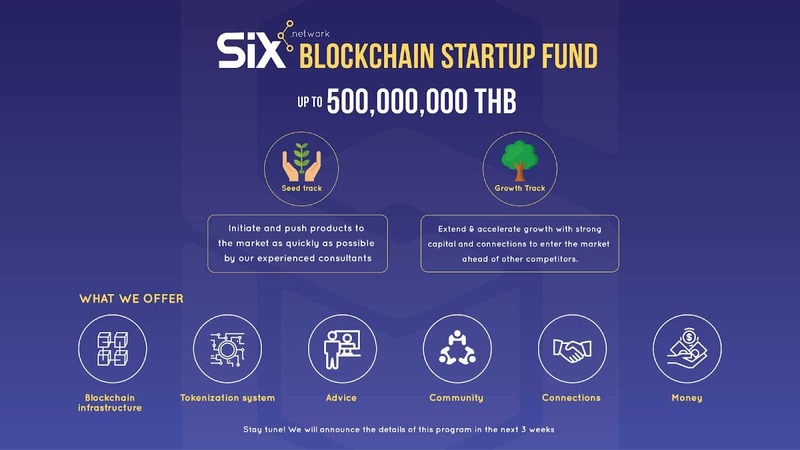 To join the program, you can contact Six Blockchain Startup Fund at this email: sixfund@six.network. The team requests that applications be kept short and based on a human story that covers the problem statement, solution, case as well as the benefits of your project. The post SIX Blockchain Startup Fund appeared first on CryptoPotato. Bitcoin Price Analysis March.28: Another Retest of $4K – Can BTC Finally Overcome The $4050 Resistance? Is Citigroup New DAR the solution for institutional crypto investors?